Buying local: a great way to support your community and get farm-fresh goods. Across New Mexico, independent grocers offer everything from fresh produce, to fresh flowers, to artisanal wine. It’s easy to find everything you’ll need in one place. Here are the 10 best markets in the Land of Enchantment. A fish market, butcher shop, bakery, as well as local, organic produce and canned and frozen foods, fresh flowers, craft beer and artisanal wine—what more could you ask for at a local grocery store? Great customer service? Yes. Deli sandwiches? Yes. A warm smile and greeting when you walk in? Yes. Special requests? Yes. Will you want to leave? A resounding no! A great full-service neighborhood market. This isn’t the only city that has this store...there are 90 throughout the south and mid-west. The best aspect to this chain is that wherever you shop, you’ll find the same quality and excellence in all products throughout the chain. More than 60 years ago, this family-owned market made a commitment to empower health, for families, individuals and the environment. The aisles are filled with healthful body care products, books, bulk foods, meats and cheeses, dietary supplements, pet care goods and organic produce. Free nutrition education, too. This is a community-based market that also supports the community, giving to local organizations on a regular basis. You’ll find a unique mix of products from local to regional to standard pantry items. Fresh made tortillas available daily, as well as a deli, bakery, butcher, dairy and frozen foods, great wine and liquor sec-tion and seasonal and organic produce as available. Lines are short; employees are helpful—shopping made easy! This store has a tortilla department! Shoppers can get fresh flour and corn tortillas, taco and tostada shells, tortilla chips and flour tortilla salad bowls, as well as all of the ingredients needed to make a meal with each of these. There’s a bakery, and a baker, on-site making fresh breads, rolls, cakes and other goodies. Rounding out the departments are meat, dairy, deli, frozen foods and fresh produce. There’s a mini flower shop on hand and a pharmacy. You don’t need to go anywhere else. This is a one-stop shopping experience worth stumbling upon. There’s a little bit of everything including specialty items from the far corners of the world. It’s a family-owned store that’s thinks of the community as its extended family. Vegetables and fruits are super fresh. There’s a wide-range of beef, pork and chicken in the meat department. The kitchen in back pumps out some incredible breakfast and lunch treats—don’t miss the tri tip sandwich; the meat is cooked in the smoker out back. Located in a historic building in town, shopping here feels like a step back to a time when growers and farmers brought their products to the town’s general store for sale. A cooperative is community owned and this old-fashioned grocery store reflects the residents’ commitment to keeping things local. In addition to local fare, there are also national brand staples and specialty items. Pick-up a hot or cold sandwich, pizza or salad made from-scratch in the store’s deli. Hangout at the co-op and catch up on what’s happening around town. This store, which first opened its doors in the 1970s, is a local landmark for resi-dents, tourists and the Native American community. Since then, it’s grown into a destination with: a full-service incredibly stocked grocery store where you can also get kerosene, propane, animal feed, hay, clothing, boots, vet supplies, stoves, tools, horse trailers, campers, fencing and live sheep for butchering. And there’s a pawn shop in back. And you can pick up your mail. And you can get the best mutton around for miles. What more could you need! 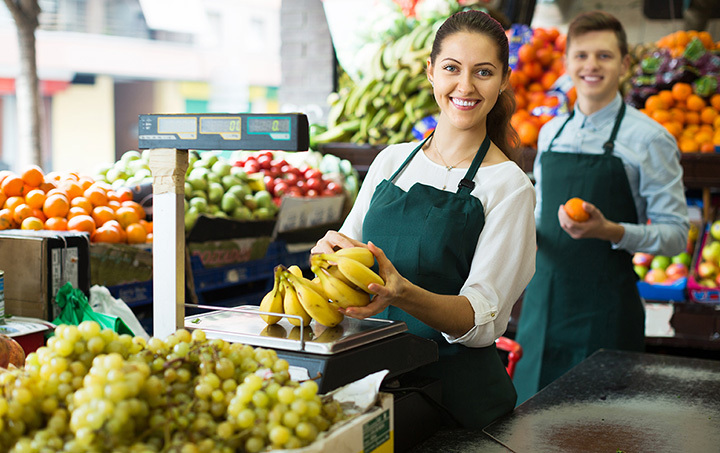 As the state’s largest community-owned natural foods market serving thousands of families with its six stores, this market is a leader in the local foods movement. You’ll consistently find local, organic, fresh and fair products in every location. Bulk foods, meats and cheese, natural body care products, handmade gifts from local artists and an exceptional deli serving delicious lunches is why so many join as members. But, you don’t have to be a member to shop at any of the store—you just get more deals! You might just get lost in this 13,000-square-foot store … but you wouldn’t starve. For more than 30 years, this store has been providing the local community, and caring for the local community, with natural, organic, gourmet and local products. Plus, you’ll find environmentally friendly household items, natural pet foods, supplements, herbs and body care goods. Prepared foods and a full-service meat counter round out the options. Voted Taos News People’s Choice Awards as the best grocery store in Taos County. Healthy living is easy and affordable: just shop here. In fact, that’s their motto, “It's Healthy Living for Less!” Even as you save, you’ll still find all natural and organic fresh fruits and vegetables, barrels of wholesome grains, nuts and sweets, a full-service deli, handmade burgers and sausages at the meat counter, fresh baked goods, read-to-eat meals, gourmet cheeses, gluten free products and vitamins and supplements. All at a price that’s affordable.